15 April 2018 by Q. Learn how to perform ICM calculations in multi-table tournaments when two or more tables are remaining or even at the MTT bubble with ICMIZER. Most tournament poker players know that in tournament poker the chips we wins are worth less than the chips we lose. This fact explains why thinking in terms of the pure pot odds or chip EV can lead to disastrous results on the bubble or at the pre-final table. 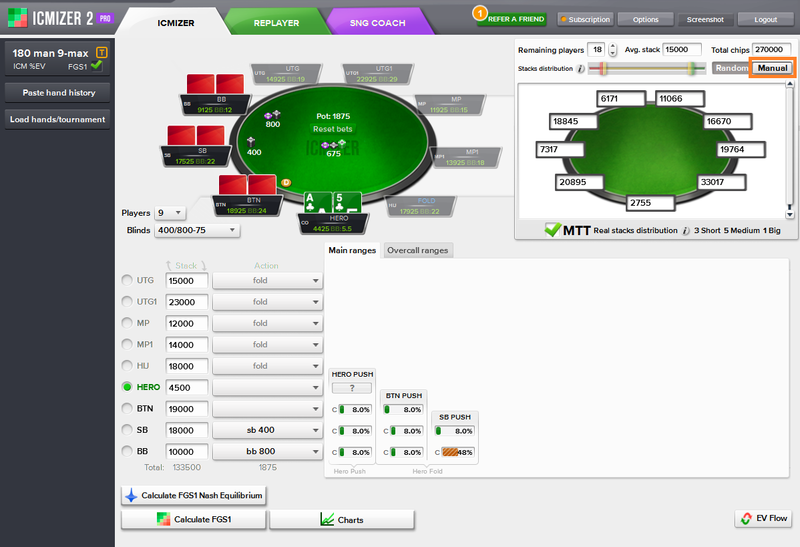 If you know how to review an SNG hand history or a final table hand history in ICMIZER, you will quickly understand how to adjust ICMIZER settings so it takes into account not just our table, but the other remaining tables and players in the MTT. The important thing is that in order to perform the MTT ICM calculation we need the same data that is required to perform normal single table ICM calculation plus we need stacks sizes of players on the other tables. Stacks on other tables influence how stacks at our table relate to the average stack size and to the MTT big stack. Currently, ICMIZER is able to review MTT situations with up to 100 players at the table, which is planned to be further increased with the upcoming release of ICMIZER 3 later in 2018. In some cases when there are short stacks on other tables, short stacks on our table actually turn out to be medium stacks out of the remaining players, which too can influence our push or fold decision. 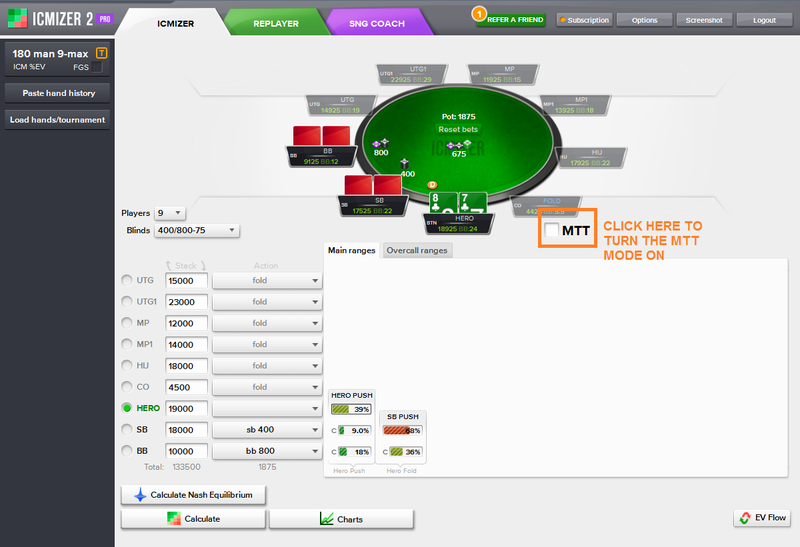 In order to give players an easy way to assign ranges on other tables, ICMIZER has the MTT Mode which features a designated window which displays the stacks on the other tables in the MTT and allows controlling their sizes. The MTT Control Window can be in two modes: Random and Manual. By default, ICMIZER uses the Random mode when you tick the MTT checkbox. This is the recommended mode because usually, we do not have precise information about stacks on the other tables by the time we get to review the hand (unless we didn't take screenshots of stacks on the other table when the hand history took place). By adjusting the Remaining players number—this should include the number of players at your table and contain the total number of players still in the MTT in the hand that we are reviewing. By adjusting the Total chips number—it is important that it is correct and contains the sum of all stacks in the MTT. By adjusting the Average stack number—if you adjust average stack size in MTT, then the total chips sum changes accordingly. In most cases, this field shouldn't be edited manually and should be left to ICMIZER to figure out of the remaining players and total chips values. you drag the special desired stack distribution slider ICMIZER uses a sophisticated algorithm to generate stacks according to that distribution. This slider has 2 thumbs, which creates 3 different-colored segments which represent short, medium and big stacks. By dragging them you regenerate stacks, and they are displayed on tables. You can also see a short legend which describes the actual result of this generation in the lower part of the MTT control window. Notice that it is not always possible to generate stacks according to the chosen distribution due to real-world mathematical limitations. For example, if in a poker tournament all chips are basically on your table, and another table has very few of them, it is simply impossible to generate a lot of big stacks on the other table. On the other hand, your table is filled with shorties, and there are just 2 tables, it will be hard to distribute the entire chips pool when we try to generate a lot of short stacks at the another table. That’s why this is called desired stack distribution, and to see the actual results of the generation you can check the stacks on the tables (or look at the legend in the lower-right part of MTT window). If you are just beginning reviewing MTT hands controlling just Remaining players and Total chips should be enough to get great late MTT tournament strategies. Given provided numbers, ICMIZER automatically generates stacks on other tables. Due to MTT nature, the exact stack distribution rarely has a big impact on your decision, due to averaging effect and lower probability of some extreme ICM case, which often occur on the SNG bubble. If you want to have full control over the stacks at the other tables you can switch to the Manual mode. In this mode, you can manually plug in all of the stacks at the other tables like you do in ICMIZER during manual single hand analysis. You can only edit the Remaining players control. The Average stacks and Total Chips become read-only and are calculated based on the values of stacks that you enter manually. This will probably only make sense when there are 2 tables remaining because if there are more than 2 table, actual stacks become less relevant, and that stack distribution we described in random mode becomes more important, so you can be easily satisfied with randomly generated stacks for situations where there are 3+ tables. Also in most cases, information about exact stacks on other tables becomes unavailable at the time of the actual hand analysis. We recommend using Random mode in most cases, as information about the average stack and remaining players is usually available, and can be figured out even after the tournament is over. Once stacks on other tables are set, just hit Calculate Nash Equilibrium button as usual and you will get the ICM calculation result for your MTT situation. Another important thing to remember is that MinDiff% in MTT generally has to be set to 0%. For a large MTT 0.01% of the TOTAL Prize Pool is a very big amount of money, so we recommend to use 0% MinDiff% for MTT hand analysis or to use the ICM $EV output so you can see how much actual $ each move is worth. Figures in dollars can be easier to relate to than some abstract percentages of the total prize pool. Too often MTT players mistakenly rely on ChipEV in their decisions. However, in literally all cases ChipEV will be more optimistic about going all-in and gambling than ICM calculations would suggest. This is especially true on the MTT bubble, where ChipEV can recommend a rather wide call, while ICM based decision will provide a very tight calling range, as busting on the bubble is about money, not about chips. Running ICM MTT calculations in ICMIZER will help you improve your MTT play with the short effective stack on the bubble, in the pre-final table situations, or ITM but still far from the final table.